Today I’m sharing a recipe that is just perfect for the first day of Fall! 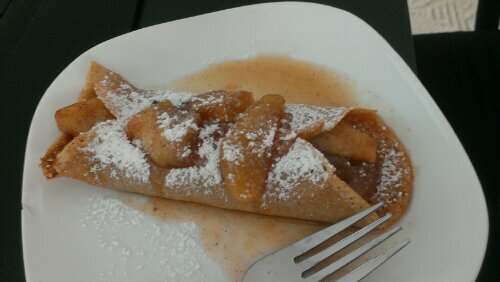 Vegan crêpes with warm spiced apple slices. Talk about comfort food! In last week’s recipe post I listed our Top 10 Favorite Fall Foods. A reader asked for this recipe, so here it is! Recently we went to the orchard for a family outing. We picked all different kinds of apples. I like to use a variety of apples when I make desserts. 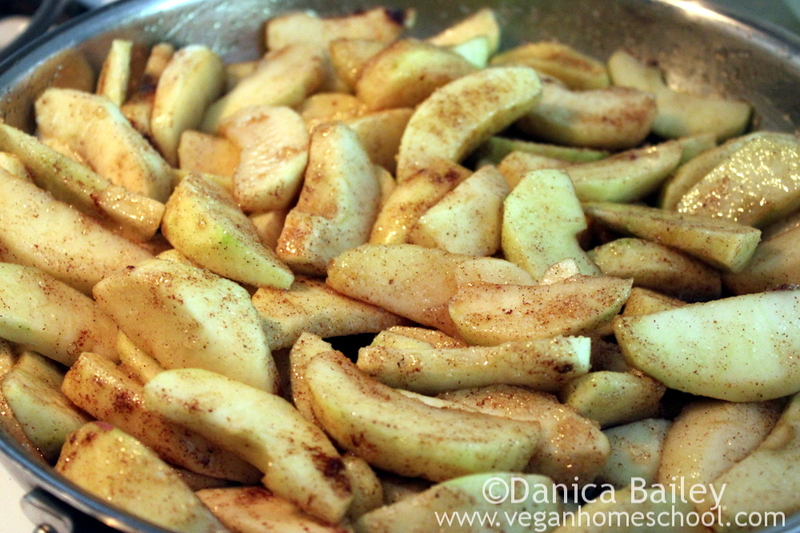 When I make spiced apples like these, I use more tart apples than sweet, but I do put a few sweet ones in there. When we made these this weekend I used Granny Smith, Jonagold, Fuji, Northern Spies and an Ida Red. It made for a great mix of flavors! 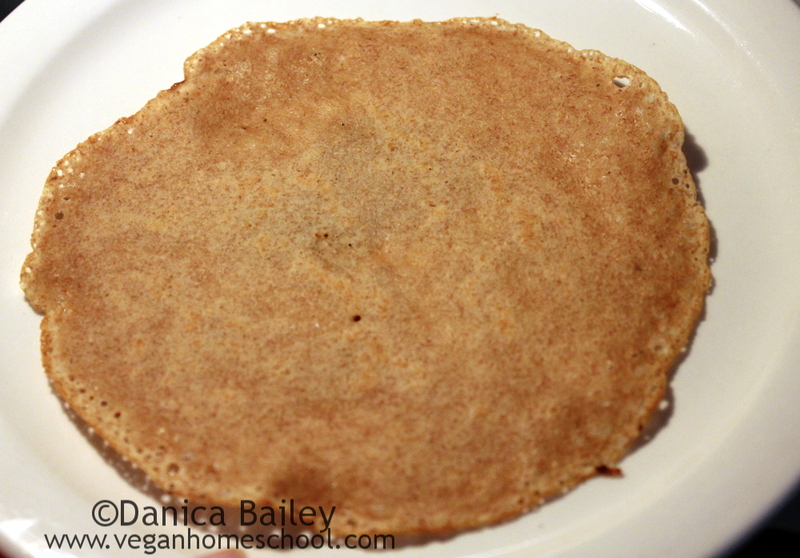 The recipe for the vegan crêpes is one that I got from Vegan Yum Yum. I’ll post the ingredients here and you can follow the link to the directions over there! If you’ve never been to Vegan Yum Yum, take a few minutes to look around. Talk about awesome vegan recipes! The hollandaise sauce in the crêpes post I’m linking to is amazing. Rich and creamy, just like the non-vegan version. Head over to Vegan Yum Yum for the directions. They’re wicked simple. Don’t skip the refrigeration step!! And whisk between each crêpe. 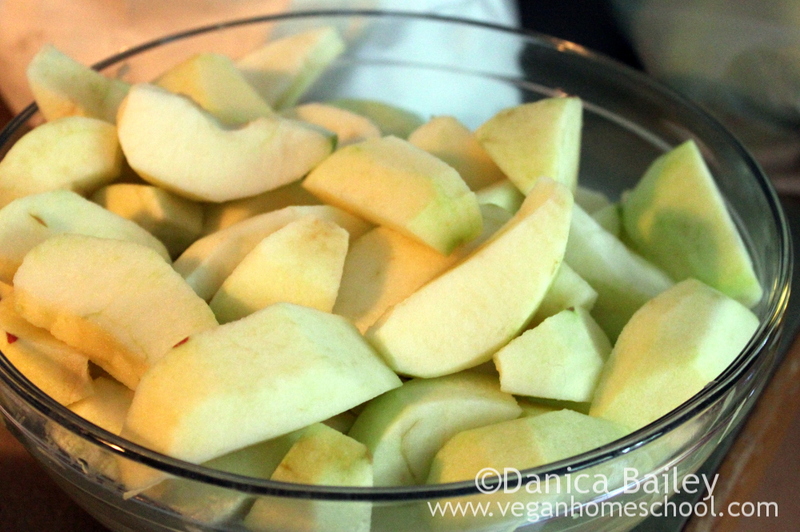 Once you put the batter in the fridge, start on your spiced apple slices for the filling. Peel, slice and core your apples. 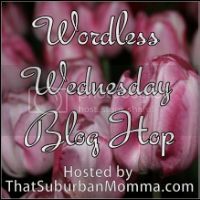 This is where an apple slicer is your friend! I slice the really big ones in half. 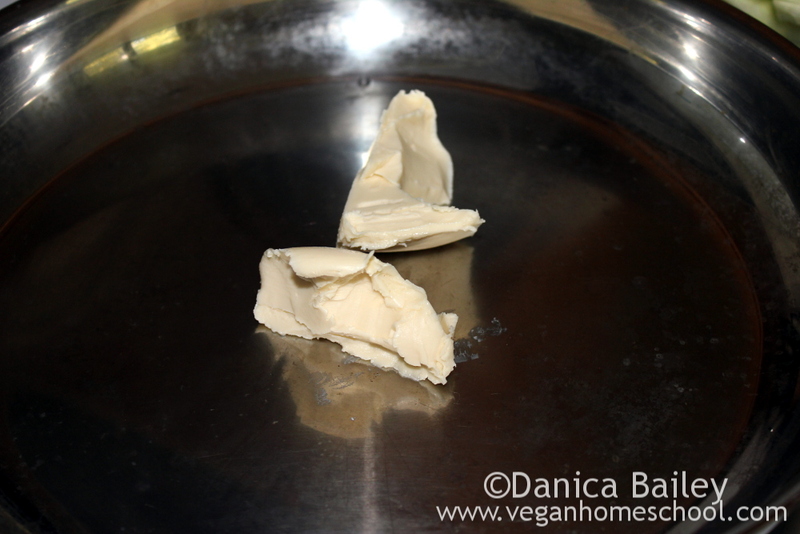 Melt the EB in a skillet over medium heat. Add the apples and toss them to coat them in the EB. Add the sugar and stir. 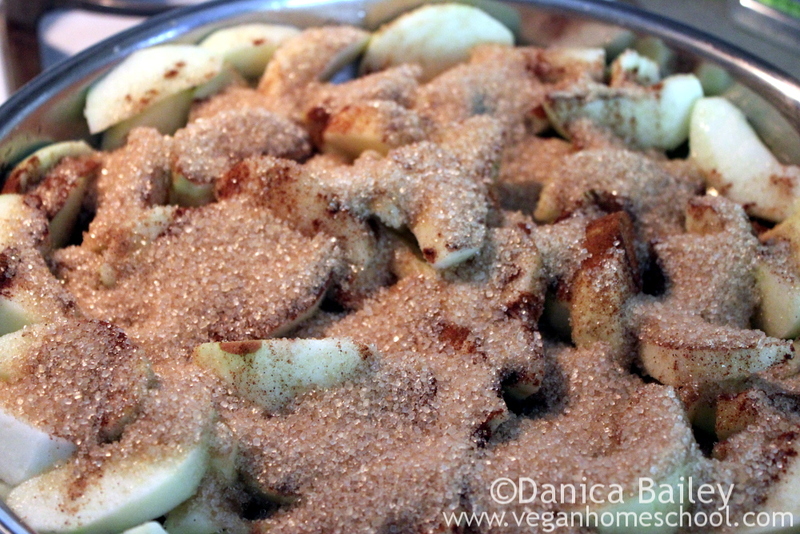 Once the sugar is incorporated, add the cinnamon and nutmeg. Give it a good stir and let the apple slices simmer. (You can start making your crêpes now if the 30 mins has gone by.) It will take anywhere from 15-25 mins to get the apples softened. This is really going to depend on their thickness and how soft you want them. Once the crêpes are done, add the apple filling and some of the sauce from the pan. Just drizzle a bit over the top. Sprinkle some powdered sugar on top and serve it up! Our boys love these will all kinds of fillings. I think their favorite is peanut butter and banana with a few vegan chocolate chips thrown in. I like to add the filling right after I’ve flipped the crêpe so that it can get all melty schmelty. Mmmmm…. Guess which pic was taken with my cell phone because I forgot to snap a shot of the finished thing? Betcha can’t guess! And there you have it! Vegan Crêpes with Spiced Apple Slices! Give it a try!!! Please remember to get those kiddoes involved in the kitchen! They’ll love it and you will to. Link up your pics of your Vegan Crêpes in the comments or post a link to your post about them!!! Oh I can not wait to try these!!! You are awesome!! Awesome!!!!! I’m so glad you guys liked them! These look so wonderful and I bet the apples smell great while they are cooking. We will be giving this recipe a try soon. Thanks for sharing it. Oh my goodness did they ever! The whole house smelled wonderful! Your crepe recipe looks really intriging and the filling looks so delicious. 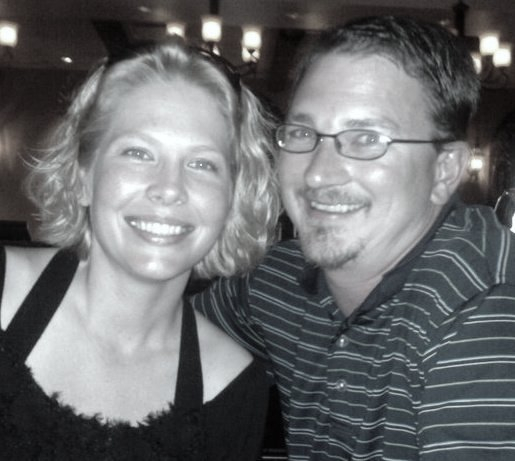 Thanks for bringing it by foodie friday, welcome. Thank you! We love these crepes. They’re so good! Thank you so much for hosting. I can’t tell you how many recipes I Pinned. LOL!